In Sri Lanka, despite the complexity of overlapping policies, the slow pace in implementing economic policies has been of central concern in the past few years. The current political state in Sri Lanka poses a series of economic, social and foreign policy challenges brought on by an unstable government. A series of events in the past can be attributed to the current instability in the country. The country’s socio economic policies are decided by domestic politics that are changed to suit the political party in power rather than by firm policies set for specific periods of time. The frequent changes in policies not only bring instability to the domestic economy but also adversely affect foreign investments which are vital to boost the economy. Looking back during the past decades a number of policy measures and initiatives had helped create the necessary socio economic conditions for the country’s development. It is these programs of mass upliftment that set the building blocks for Sri Lanka to achieve high levels human development despite slow economic growth. Sri Lanka ranks up 76th place in the United Nations Development Program’s (UNDP’s) Human Development Index (HDI) score among 189 countries. The country continued to maintain its position in the high human development category well surpassing the average HDI score for South Asian nations. Year 1978 will remain an important year in Sri Lanka’s political history with the adoption of a new constitution. Accordingly, the Executive President replaced the Prime Minister as head of State. J.R. Jayewardene from the United National Party (UNP) as the first Executive President brought in significant structural changes to revive the country’s then stagnant economy. Economic growth almost doubled in Jayewardene’s first year in office with a GDP growth rate of 8.2% in 1978 compared to 4.2% in the previous year. However, Jayewardene’s term was marred by the civil war between the Government of Sri Lanka and the Liberation Tigers of Tamil Eelam (LTTE) that emerged in 1983 resulting in the economic growth rate hitting an all-time low of 1.5% in 1987. During his tenure Jayewardene launched the massive multipurpose Mahaweli hydroelectricity generation scheme, Free Trade Zones and the Colombo port development project and provided the Mahapola Scholarship for university students requiring financial assistance. Jayawardena was succeeded in 1989 by Ranasinghe Premadasa also from the UNP. Premadasa’s progress into politics can be traced back to his Sucharitha movement a community project for the upliftment of the poor. Once the Deputy Mayor of Colombo he gained national prominence for his 1 million housing scheme when he was Premier under Jayewardene’s Cabinet and for the 200 Garment Factories project during his rule from 1989 – 1993. During his tenure Sri Lanka faced internal threats not only from the LTTE in the North but also from the Janatha Vimukthi Peramuna (JVP) Insurgents from the South. In 1994 Chandrika Bandaranaike Kumaratunga, the daughter of two former Prime Ministers, emerged as President from the Sri Lanka Freedom Party (SLFP) ending 17 years of UNP rule and bringing in a new democratic political culture to the country. During her decade-long tenure, Sri Lanka’s per capita income almost doubled from $ 655 in 1994 to $ 1,242 in 2005 to reach the level of a lower middle income economy. Further, during the same period unemployment was almost halved from 13.1% to 7.2%. Sri Lanka also became a beneficiary of the EU’s GSP plus scheme in 2005 which provided exporters duty-free and quota-free access to the EU countries. In addition, the Free Trade Agreement (FTA) with India was signed and enforced during her term. In 2005 Mahinda Rajapaksa from the United People’s Freedom Alliance (UPFA) ran against rival Ranil Wickremesinghe to win a tightly-fought presidential election. Seen as a strong nationalist, he was instrumental in defeating the LTTE in 2009, bringing to an end the nearly three-decade-long civil war in the country. He easily won re-election in 2010. In the post-war period Rajapaksa commenced massive development projects mostly through borrowings from China such as the Colombo Port City project, the Southern Expressway and the construction of the port and airport in his home town Hambantota. These investments contributed towards achieving an average economic growth rate of 6.8% in the next five years compared to 3.5 % in 2009. However, during his tenure, relations with India were on the decline and Rajapaksa had to face challenges from the United Nations Human Rights Council (UNHRC) for alleged war crimes during the civil war while also losing the GSP plus facility secured during the previous regime. In 2015 Maithripala Sirisena became the sixth Executive President of Sri Lanka defeating incumbent Rajapaksa in a surprise election victory. Sirisena who was a Minister and general secretary of the ruling Sri Lanka Freedom Party (SLFP) unexpectedly defected from Rajapaksa’s Government to contest the presidential election as the Opposition’s common candidate. Sirisena as President formed a Coalition Government with the UNP appointing its Leader Ranil Wickremesinghe as Prime Minister. However, the resulting coalition faced many problems with the President and Prime Minister having opposing views on running the country. Many of the development projects that were commended during the previous regime were stalled only to be restarted such as the controversial $1.5 billion Colombo Port City project. The country regained the GSP plus facility in 2017. However, the economy slowed down with the GDP growth rate falling to 3.1% in 2017 from 5.1% in 2014 and the rupee depreciating to its lowest rate against the US $ in 2018. The turn of political events that occurred after 26 October are multifaceted since President Sirisena swore in Rajapaksa as Prime Minister. 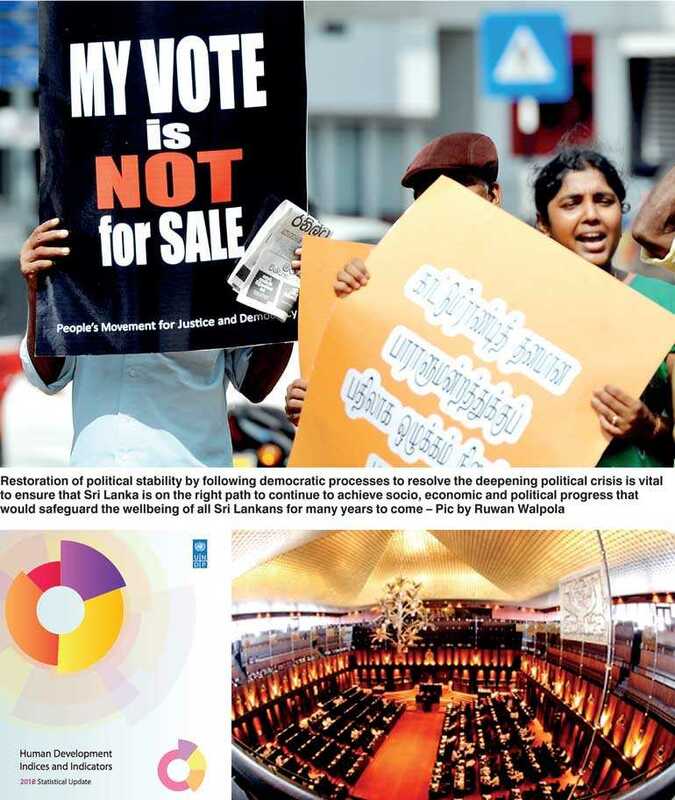 The ensuing political instability with both Wickremesinghe and Rajapaksa claiming to be Prime Minister could have several negative economic consequences for the country. Several countries have threatened to withhold foreign assistance to Sri Lanka while the EU has warned that it would consider withdrawing the GSP plus concession. This uncertainty will also adversely undermine foreign investor confidence. Hence, restoration of political stability by following democratic processes to resolve the deepening political crisis is vital to ensure that Sri Lanka is on the right path to continue to achieve socio, economic and political progress that would safeguard the wellbeing of all Sri Lankans for many years to come.